Once again, it's that time of year and Twisted Tools is celebrating the holidays with a free gift for you and by having a storewide sale. THE RING - BLOCKS EDITION is a temporal modulation tool for creative sound design and a live performance using REAKTOR Blocks. The release consists of an iPad *LEMUR template and a brand new REAKTOR Blocks module, together giving you the ability to get away from the mouse and modulate your Blocks using the power of touch. The Blocks Edition of THE RING comes with a REAKTOR Block module, called THE RING - OSC RECEIVER. This module automatically receives and converts OSC control messages sent from the iPad to audio rate control messages designed to be used as modulation signals within the REAKTOR Blocks framework. 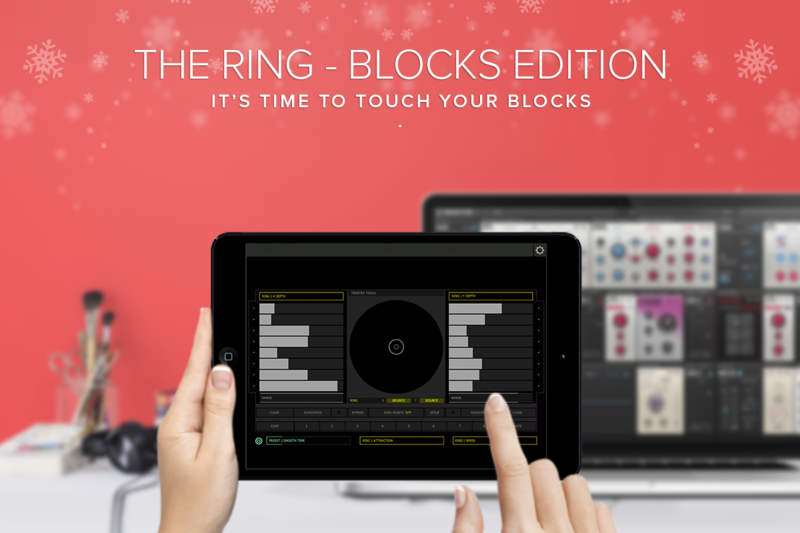 This allows you to control REAKTOR Blocks using your iPad running THE RING inside the Lemur app. The only setup required is the OSC configuration, but other than that the Blocks module takes care of the rest. Just patch away as if it was any old REAKTOR block.